I’ve been too busy to fully explore the new Cathedral Square precinct – the brick and stone heritage buildings known collectively as Perth’s State Buildings, located on the corner of Barrack Street and St Georges Terrace – but I’ve managed to grab breakfast at Petition Kitchen on three mornings before work. Each time, I’ve walked into a welcoming dining room of neutral tones, with wood and soft leather furnishings, and natural light streaming in through tall windows. I don’t think I’m a fan of the coffee so far, but the food’s been terrific. On my first visit, I wanted the smoked sardines but they were all out, so instead I ordered what turned out to be a delightful dish of torched ocean trout, pea salad and slow cooked egg with a slice of rye toast. Last week I had ‘Everything Breakfast’, a good feed and great value at $16. You get slab bacon, a soft boiled egg, toast and spreads, a wee pot of yoghurt with fruit and granola, freshly squeezed orange juice (or grapefruit if you prefer), and coffee. Yesterday, I had the smoked sardines, served on toast with tomato escabache, marjoram and salted lemon. Brilliant colours, vibrant flavours – a stunner of a dish. 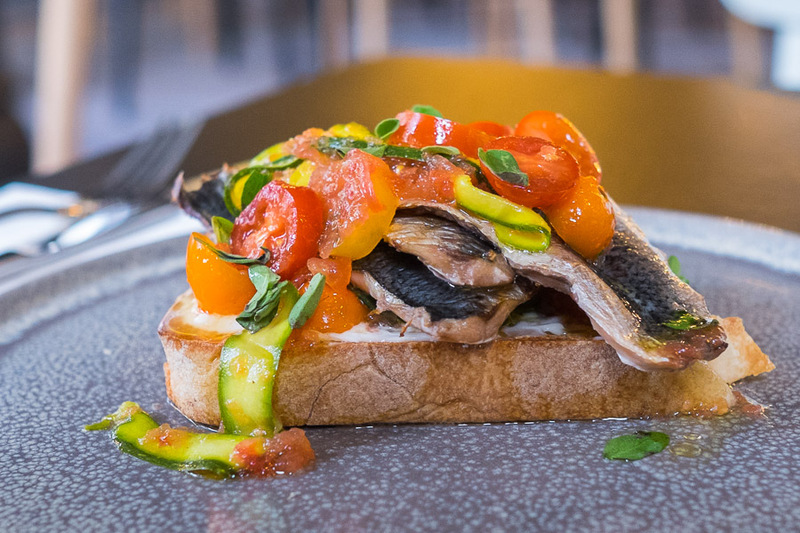 The whiskery fishy little fish won’t appeal to everyone for breakfast, but the pairing with gleaming, lusciously juicy tomatoes is sensational and I’d choose this again without hesitation. I’m keen to keep eating my way through the breakfast menu. The sardines dish is a showstopper and the slab bacon is wickedly succulent. In fact, I came close to ordering bacon on the side (AU$5) with my sardines, but decided I was just being greedy… I lamented my decision when the fellow next to me finished his pikelets and pushed aside his empty plate to make room in front of him for a plate of slab bacon that had just arrived. Bacon lovers, regret definitely has a smell; it smells like the slab bacon you didn’t order. Remember that. 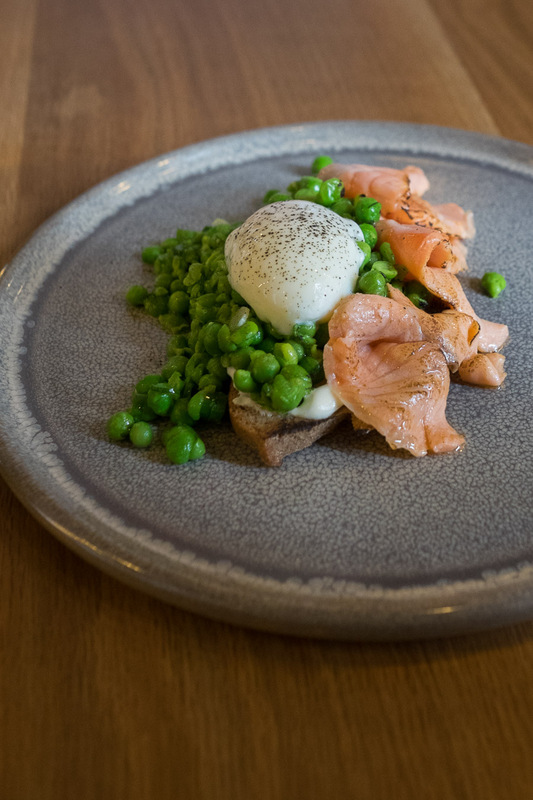 Torched ocean trout, pea salad, slow cooked egg and rye (AU$17). 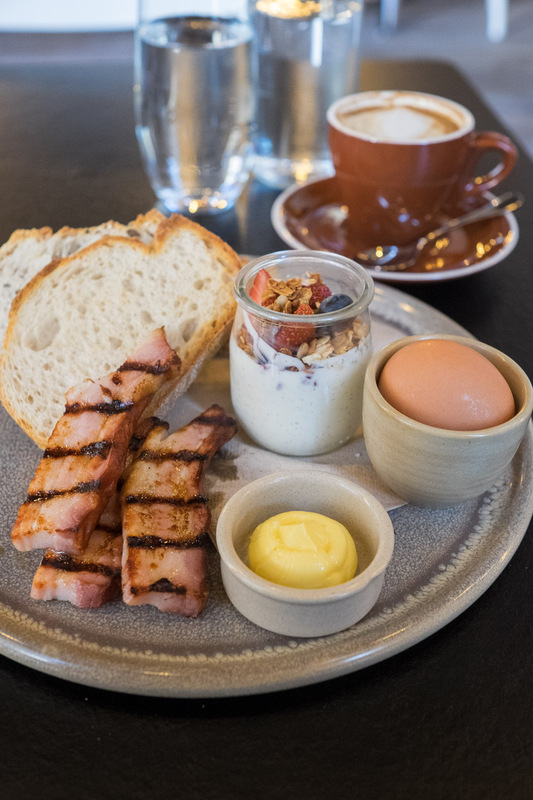 Everything Breakfast (AU$16) – boiled egg, slab bacon, yoghurt & fruit, toast and spreads, juice, tea/coffee. 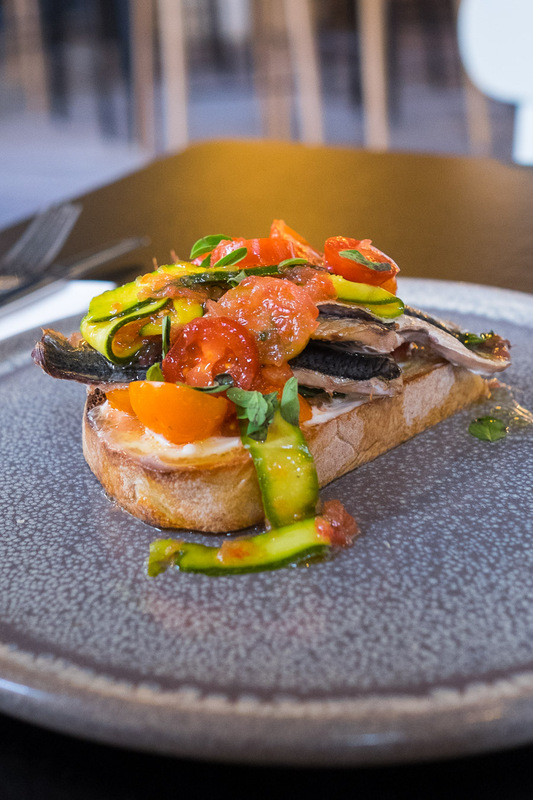 Smoked sardines on toast with tomato escabache, marjoram and salted lemon (AU$16). Petition Kitchen is located in Cathedral Square – the 140-year-old State Buildings on the corner of St Georges Terrace and Barrack Street, Perth. These iconic buildings which have stood run-down and dormant for so long have been restored and reimagined, soon to become a thriving hub once more. It’s not just the ghosts of public offices that make the State Buildings significant in our history. Among these grand old buildings is the site of Perth’s original General Post Office where you’ll find Point Zero – where all road distances in WA are measured from. In addition to Petition Kitchen, there’s Petition Wine Bar & Merchant and Petition Beer Corner. 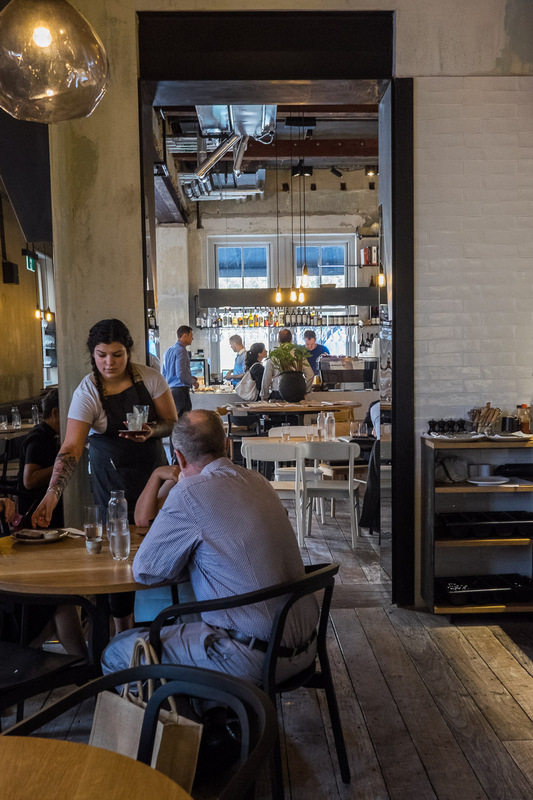 COMO The Treasury, the precinct’s luxury hotel includes dining options Wildflower (the fine dining rooftop restaurant); Post (on the ground floor in the old franking room of the original Perth GPO); and COMO The Treasury Lounge and Bar where afternoon tea is served on the weekend. There’s also Telegram Coffee and Halford Bar. Specialty shops for sweet tooths: Sugarplum Sweets, The Honeycake and Sue Lewis Chocolatier. The highly anticipated Long Chim Perth opens on 1 December. Check out this great map of Cathedral Square which marks not only the hotel, bars and restaurants, but also pinpoints the location of the public art pieces – I found it at Cathedral Square’s Facebook page. The above only captures some of what you’ll find now at Cathedral Square, and there’s even more to come.